Another weekend, another opportunity to fall on my arse and bruise my elbow. Aptly timed to coincide with practising roping up when walking over tricky terrain. Technically the terrain wasn’t so tricky and it was just for practice, didn’t stop me giving it a go. 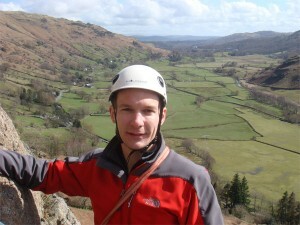 So that’s me obscuring some of the view of the Langdale valley halfway up a route on the crags there. 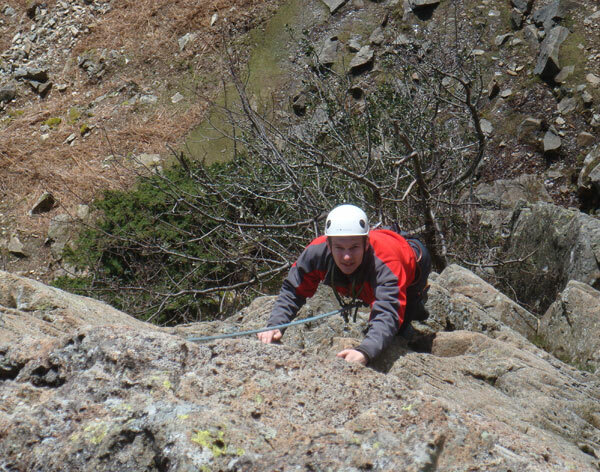 Second from last climb of the weekend and the weather had turned nice, we no longer needed the waterproofs and gloves. In fact, occasionally I’d go so far as to say it felt warm. My easy week was truly easy with a little training in the run up to the weekend, less than I’d planned. I headed up to Kendal on Friday and after struggling to entertain myself in the town during the afternoon I opted to go for a run. Perfectly timed to catch the worst of the days weather as I returned to the B&B. It proved to be a decent hill session though, hard to avoid up there. Saturday and Sunday were then spent experiencing climbing outdoors for the first time. No more reassuring, colourful holds to guide me and a lot more time being damp. Saturday’s weather report had promised to be pretty bad, but to be honest I think I got off lightly. The first half of the day was spent getting used to following up some easy routes and the rope work involved in climbing outdoors. I was relieved that as I got higher I didn’t get more nervous, my focus remained at climbing the rock to hand ad not how high up I was. That said there were a couple of times over the weekend where the height helped me focus on getting past an awkward situation and avoiding falling. I finished Saturday with a climb of Little Camonix in the rain and wind. Taking the positive view it gave me a chance to try out the waterproof layers I’d bought ready for the Alps later this year. I’m pleased to say they worked. From the whole of the weekend belaying my guide, Tim Lofthouse, sat astride a block of rock halfway up the route in the wind and pouring rain will stick in my mind the most. Despite the weather it was an enjoyable day and very satisfying to have managed to climb in those conditions. I’m assured if I’m happy to cope with that then I’ll be fine with Alpine conditions. Sunday we headed to the Langdale region. The day started off a bit damp with some wet rock to struggle over at first. It made the climbing a little more exciting at times! I got to abseil for the first time and after overcoming the initial it’s just me holding the ropes tight on the belay plate stoppng me falling nerves I really enjoyed it. Would have liked another go! We moved to the final area of the day and got a couple more climbs in, this time with sun. The rock was a bit drier, well except for a tiny waterfall halfway through one route. On the one hand it was kind of fun having a bit of water splash on you, on the other the wet holds were less fun. I created a bit of extra excitement for myself by traversing a section too low, removing some protection, realising my mistake and having to back track a little uncomfortably aware that I’d now be more likely to swing if I fell. It proved to be a good incentive to get me through, though my shoulder crunched in disapproval at some of the pulling my arm was doing. Despite some vaguely good intentions a combination of poor weather and fatigue from a day spent outdoors meant I never managed a run the rest of the weekend. Making a total of 0 hours tri training for the period. I got home today and spent an hour on the rollers doing a nice easy spin to get back into things and have bigger plans for the rest of the week. I can’t complain about the small break it’s been 3 full months of solid training building my volume and effort up and without any significant breaks. Climbing was a great way to take a break too, still active, still needing mental focus, but an entirely different discipline to my usual routine. 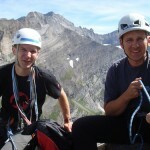 I can’t wait to go for the Alps and hope to get back to the crags at the Lakes sooner.